I was contacted by Kathryn, regarding a new idea for soda by the company Spindrift and was really excited about it. I am not a big soda drinker, I really try to stick to water because soda is just not good for you. Every once in a while, I indulge, but not often. Spindrift has taken the love of soda, but has joined it with all natural ingredients. It is as they say, an "anti-soda" because it is made from fresh squeezed fruit (pulp and all) with carbonated triple filtered water along with cane sugar . The Orange Mango was a real light and airy treat. It basically tasted like eating both fruits at the same time. The flavor was amazing and this makes a great summer time drink. I am not a fan of lemonade, but this was really quite tasty. My mom loves anything lemon, so she had most of this one. Just a really light, refreshing drink and you can really taste the lemon flavor. Blackberry is another wonderful flavor they offer. I really like the fact that these are made from real juices and natural ingredients. If you are going to indulge on some soda, Spindrift is a good choice. You can click HERE on their website to see what flavors are carried in your local stores. Online shopping is also available on their website. Do let me know if you try it, what your thoughts were! I think you will really enjoy it very much. I have not received any monetary compensation for posting this content and I have no material connection to the brands, topics and/or products that are mentioned herein. 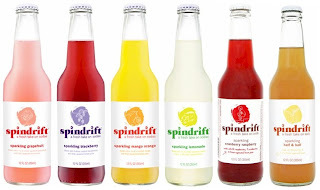 I was provided with 6 bottles of Spindrift Soda for this review. My opinions are 100% my own. I'm a total soda drinker, and love the idea of natural ingredients. I'd totally try this. these are unique and very refreshing for summer I am hoping my local Wegmans may start carrying the line as it seems right up their alley. a nice treat once in a while or great for parties for a unique drink! !